Life cycle: This insect produces several generations each year. Overwintering occurs in the egg stage. 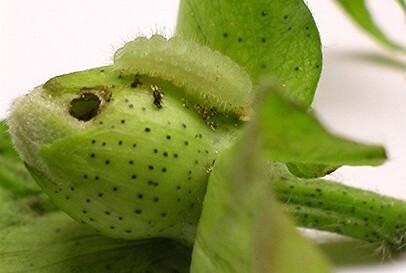 Physical Description: The 1/2 inch long caterpillar is bright green to yellowish and is covered with fine hairs. The adult butterfly is bluish or gray with black and orange spots on its wings. This butterfly has a wingspan of 1 inch and rubs is two hind wings together when at rest. The isolated eggs are green and laid on foliage. Feeding characteristics: The Gray Hairstreak attacks apple, bean (especially lima), and citrus plants. The larvae will feed by chewing the leaves, and later the fruits and pods, but will seldom do serious or extensive damage to the plant. Controls: Various Trichogramma Wasps are natural predators and can aid in controlling this pest. If damage is intolerable, apply Bacillus thuringiensi.